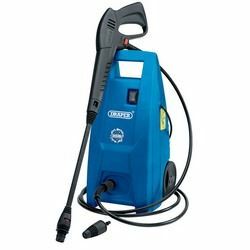 Compact, lightweight and mobile pressure washer for domestic duties. Perfect for cleaning decking, patios, garden furniture, bicycles, cars etc. Manufactured with an automatic total stop system that activates/deactivates the motor increasing the motors life while reducing electricity consumption. Supplied with 3M of hose and gun, turbo nozzle, fixed jet nozzle and detergent spray bottle. Display packed.